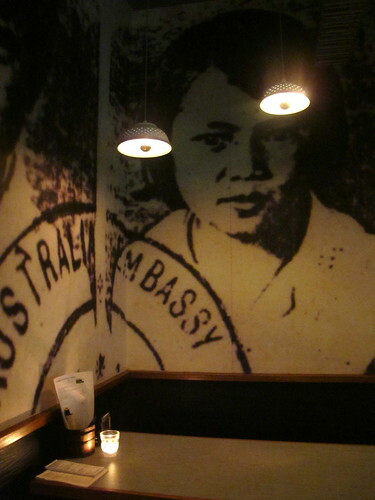 Miss Chu opened a few months ago, a Melbourne version of Nahji Chu's popular Vietnamese tuckshop in Sydney's Darlinghurst. 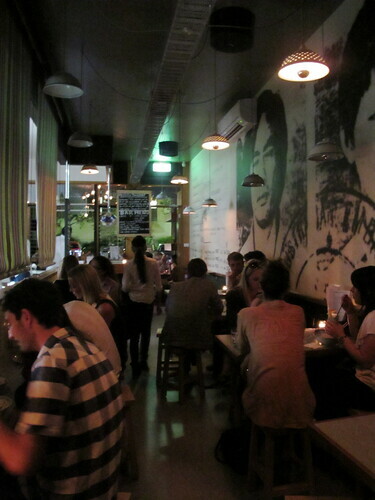 The tuckshop is very casual (no bookings), dishing up hawker food with a bit of a contemporary twist. I like several of the dishes but have noted some consistency issues over the course of my visits - hopefully they manage to iron them out soon. 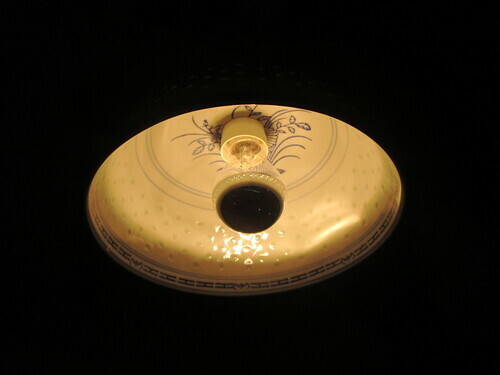 Love the light fittings made from blue & white porcelain bowls. I'm not usually a fan of rice paper rolls, but I have to admit that these ones with roast duck and banana flower ($8 for two) were pretty great, accented as they were with lashings of shiso and Vietnamese mint. 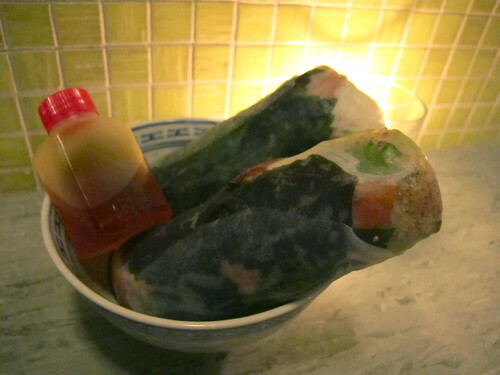 Other rice paper roll combos that are available ($6 for two) include tiger prawn & green mango, satay chicken & coconut young and a vegan option. 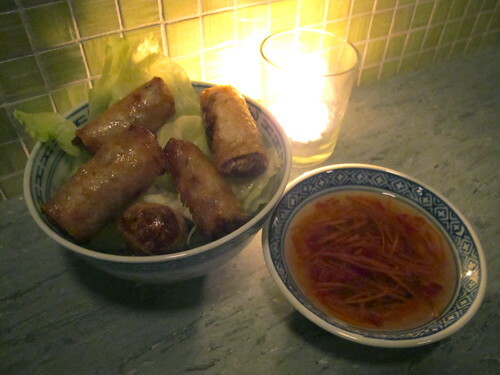 I can also recommend the spring rolls - we had the traditional Hanoi pork ones ($5 a serve). 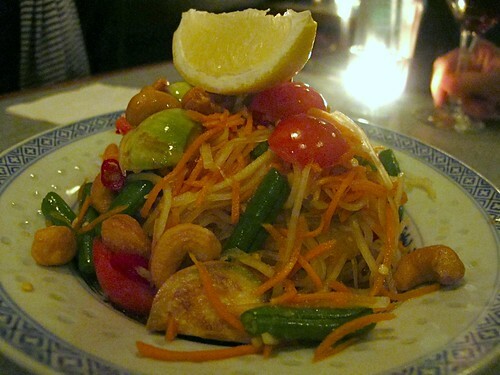 On another visit, we were disappointed by the som dtum ($12) - too much carrot and cashew filler, not enough green papaya. 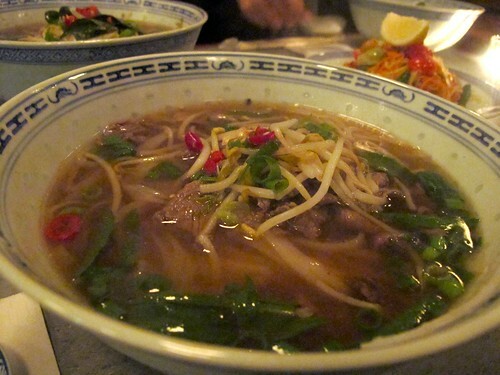 But we did love the wagyu pho and its rich broth (though paying $13 for pho still stings a little, even if the beef IS a cut above). 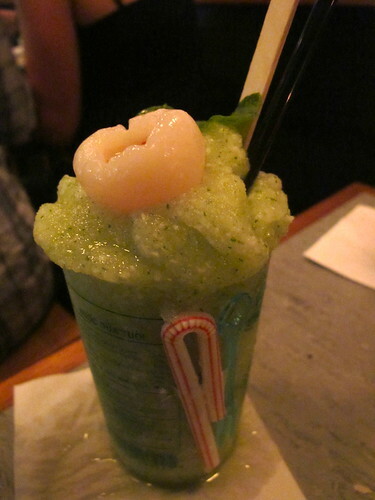 Drinkswise: juices, beers, wines and whiskeys are on offer, as well as varieties of "frozen young coconut crush" ($5, or $9 spiked with vodka). I had lychee & cucumber. The Miss Chu menu also includes dumplings (of which I have heard mixed reports) and several kinds of warm vermicelli salads ($12). They also offer a dial-a-dumpling service for locals, delivering within a 1km on G-force electric bikes - as their website quips, "you ling, we bling!" 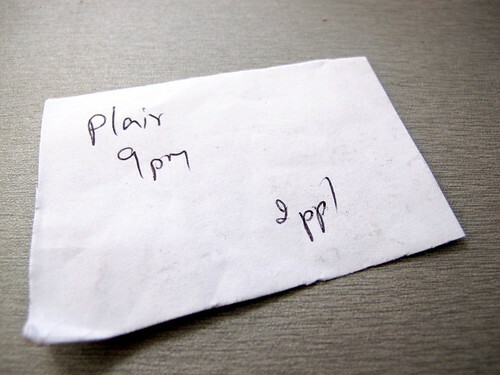 Appetizer has been open for a few years now, but its existence has been kept a jealously-guarded secret by its fans (whispers about it started spilling out through Twitter about six months ago, and then on Penny's blog). 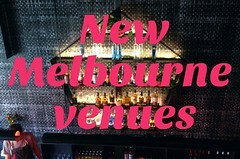 It's tucked in the very corner of the CBD grid, diagonally opposite from Carlton Gardens. 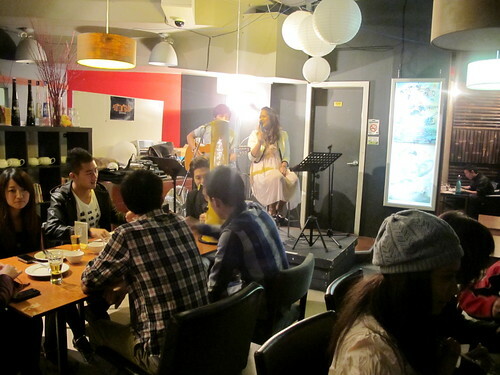 As Penny wrote, the place is "totally Asian" - international students (from the next door City Park Apartments complex and beyond) make up much of the clientele, the mostly-written-in-Thai menu hasn't been watered down for Westerners, there's live Thai pop music inside and optional shisha & beer towers outside. I went along one Friday night with best-friend-K and a colleague of hers. 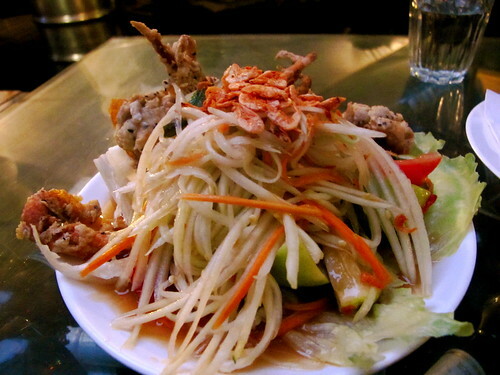 We ordered the som dtum version with crispy soft shell crab ($15.90) thinking it would be the mild antidote to the other dishes, but in amongst the fresh papaya the chilli still had a real kick to it. We loved it. 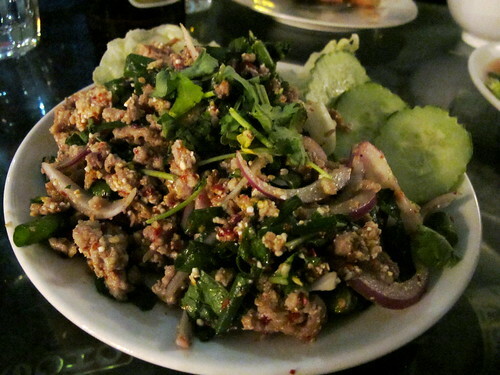 Equally spicy was the larb gai ($12.90), though the roasted rice was ground rather more coarsely than I'm used to. 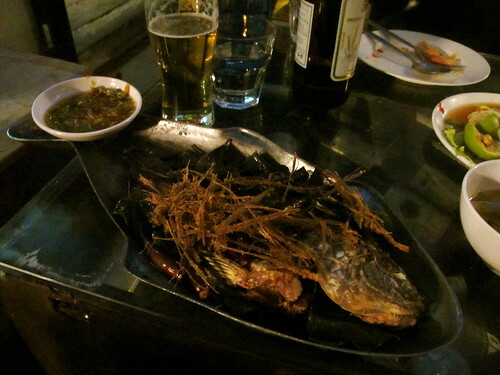 The one disappointment was the whole crispy fish (market price): it was too dry and the dipping sauce was rather dull. 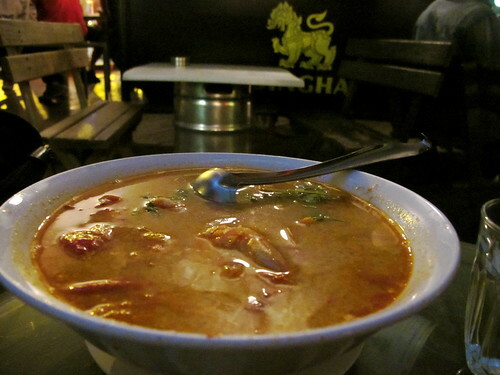 But boy did we love the Bangkok style tom yum goong ($16.90), with its enormous prawns and almost-make-you-cry spice! I'm keen to head back soon, as there's still heaps on the menu I haven't tried (including all sorts of porky dishes that b-f-K doesn't care for). 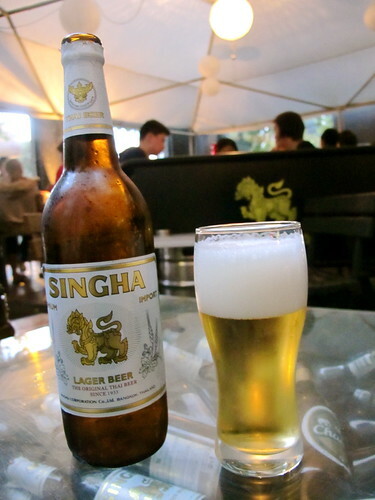 I'm yet to find a Thai restaurant in Melbourne that I like as much as my favourite Thai places in Sydney, but Appetizer comes very close. I’m loving the sound of both of these place but I’m definitely going to have to try Appetizer – Mr K and I find it incredibly difficult to resist anything that’s ‘almost-make-you-cry’ spicy! 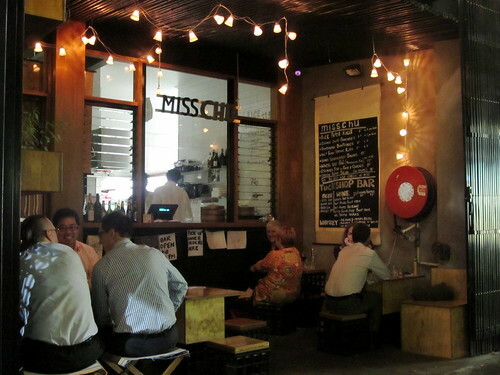 I went to Miss Chu when it first opened and was really impressed with it. I loved everything, especially the salads. 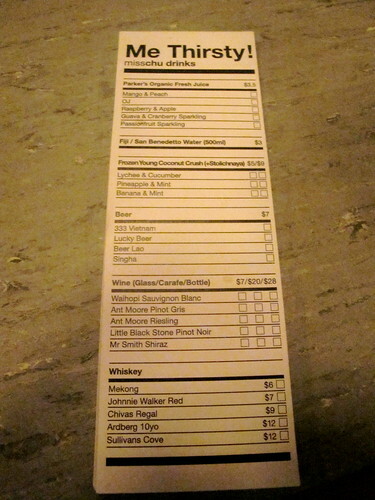 I went back and noticed that the portion sizes have shrunk. Hopefully it is just opening kinks because otherwise it's great value. 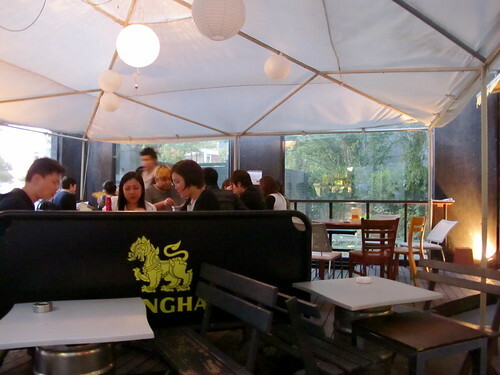 Han Guuk Guan although not technically cbd has some good cheap Korean food. 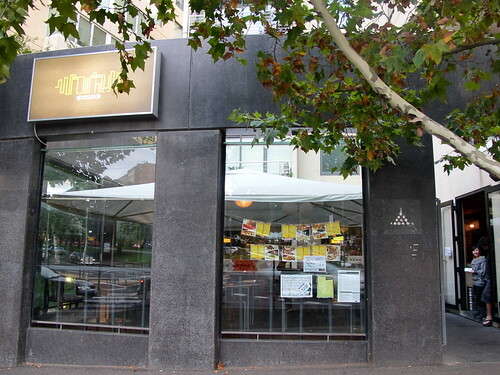 Gami can give you your hit of deep fried – and if their halogen lights are too much, eat it at Chez Regime over an extremely reasonable priced drink (byo food, except souvlaki!). Babbo is always busy too. Sallys kitchen was a total disappointment. Early Saturday morning, I walked in to ill-chosen and inappropriately loud music. Disinterest staff looked like they were still reeling from the night before. Coffee was spilt all over the saucer, and tasted average. Had to ask for milk with my tea. Scrabled eggs had crispy bits from being fried? The linen is a nice touch though. Hope it was a one off. 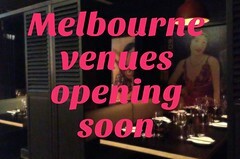 Hi FGF, I went back again on Tuesday night. Tom yum goong was still incredibly spicy, and I loved the crispy soft shell crab with curry sauce. Thanks Anonymous #1, I'm keen to try a salad next time I visit. Thanks for the tips Anonymous #2! I went to Miss Chu today for lunch with some people from work and we all loved it and they thanked me for choosing such a great place. In turn i thank you! i'm up at the paris end but rarely make it out for lunch so i am looking forward to all the places you discover! !